This romantic, ethereal lavender Elie Saab gown went perfectly with Mila’s dark hair. I love the touch of lace at the bodice, and the texture of the whole thing. RDJ can almost always be counted on to take chances on the red carpet. He doesn’t always succeed, but I think this year he did. I’m a sucker for navy tuxes, anyway, but paired with that white tie and the silk trim on the lapels, and I’m all a twitter for this. I would’ve liked this gown without the texturing, if just for the color. But this Dolce & Gabbana gown goes the extra mile with the pattern and texture. Working with something burgundy, with a vaguely floral pattern, they took the chance that it could end up looking like upholstery. But this turned out great. I really love the sheer lace quality of the top of the dress, around the neckline. A lot of guys seemed to opt for more complicated tuxes last night – with vests and buttons all over the place (I think I even saw a few double-breasted jackets). 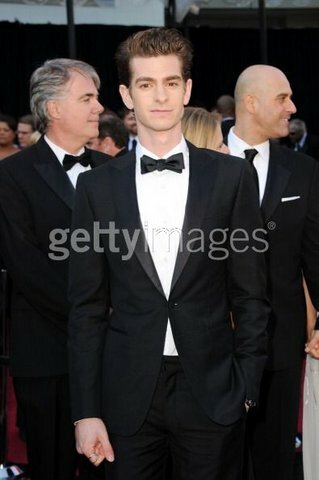 But Andrew kept it nice, clean and simple in a well-tailored suit with a single-button jacket and a classic bow tie. I’ve said it before, and I’ll say it again, but if you look as good as Dame Helen does when you’re the same age, then you must have done something right. She consistently wows on the red carpet, and this elegant silver gown is no different. Helen often opts for sleeves, I think, but I appreciate the chance she takes in doing so. In fact, the sleeves and bodice are easily my favorite parts of the dress. This is the gown everyone is talking about today. It could truly be a historical moment in red carpet fashion history. Cate had balls to go out in something so strange, so very high-fashion. I adore the texturing, I adore the shape, I adore the color, I adore the little embellishments. All in all, this Givenchy Couture gown made Cate into a walking work of art. Adams hit the red carpet looking very old-school Hollywood. From the sequined gown to the loose, softly curled hair, to the shape of the dress, she looked every bit the part of a screen siren. The rich blue color looked tremendous with her hair, as well. I’m a bit “meh” on the green and silver jewelry she chose, but it can’t really ruin the solid look she has going on. Like Sandra Bullock, Anne looks good in red. This is a very structured Vintage Valentino gown. I love the complex shape of the skirt. If you look closely along the hemline, you can see the beautiful patterned fabric the skirt was lined with.